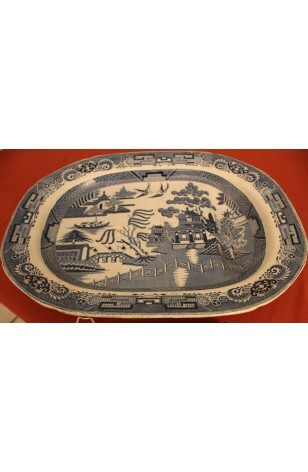 Antique - Staffordshire China, Blue Willow Pattern, Large Ironstone Meat Platter, Made from 1853 to 1868. This beautiful, and large Staffordshire Ironstone Meat Platter, is 19 1/2" x 16" Oval. On one end of the Platter, there is a deep Well, for the meat juices to drain into. Even though showing some natural signs of its age, this Meat Platter is in really good condition. This beautiful, and large Staffordshire Ironstone Meat Platter, is 19 1/2" x 16" Oval. On one end of the Platter, there is a deep Well, for the meat juices to drain into. Even though showing some natural signs of its age, this Meat Platter is in really Good Resale Condition unless noted below or viewed in pictures.